This book from Packt Publishing is the best one I have run across in 2009. Often they are a bit off the mark on order, cohesion and readability, but this one is spot on for business rules developers. I think that this will become the bible for JBoss BRMS developers as it covers all the details you need to get your projects rolling. After a very short introduction (as it should be, we are developers and want to get started), this book dives into the basic rules syntax and validation. You are then walked through the process of how to load facts into a knowledge session which is all about data transformation. When dealing with rules we often have to make sure that the business users are not left out in the cold. The author take a good look at Domain Specific Language (DSL) implementation in Drools, decision tables and dealing with Drools Flow. These are all supported with examples and code to feed the developer learning how to make use of these elements of a rules implementation. A walk through stateful sessions is followed by Complex Event Processing (CEP) with Drools Fusion and supported with a fraud detection example. This is really interesting and feeds me at the technical depth I expect from a developers guide. 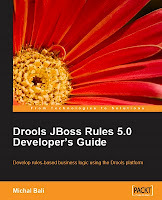 There is an entire chapter spent on the details within Drools Flow and this is followed up with a sample application to walk you through all the details of setting up and executing a rules project. Testing is touched on briefly, along with some integration topics (Spring and the JSR94 standard). Finally, the book finishes up with a look at performance, providing you with insights to help you optimize your rules projects. This book is well written, contains good technical depth and is very thorough. There is not much left for you to look for on JBoss with regards to your rules projects. You need this book on your development shelf if you are working with JBoss and rules in your organization.